I'm going to Scotland next week and i'd like to drive from Beauly (Inverness) to John O Groats. I watched the Grand tour where they drove some of the NC500 and thought that if i went all the way to John O Groats could come back down on the road they followed. Does anyone know what road it is? I want to drive the NC500 from Inverness to John O groats but the Grand Tour cut though the top and din't go to John O groats. If i followed the NC500 after john o Groats i could then drive down the road they Drove up on the Grand tour. If you understand what i'm trying to say... It is hard to explain. I think I get it! If you go to John o' Groats, and then head west, you'll get to Thurso. At that point, you probably have two options to head back south - both leave Thurso by the same road. One would stay further north, heading towards Wick, and then down the coast again. The second turns off this road, about 4 or 5 miles (?) from Thurso and heads further south, but again, just heading for the A9 down the east coast. This crosses the Causeymire moor, and meets the coast again at Latheron. Basically they are two options to make a small loop at the top. I'm at a bit of a disadvantage as I haven't seen the Grand Tour! The Causeymire road is more open moorland, less farmed. The GT team missed the whole North coast! 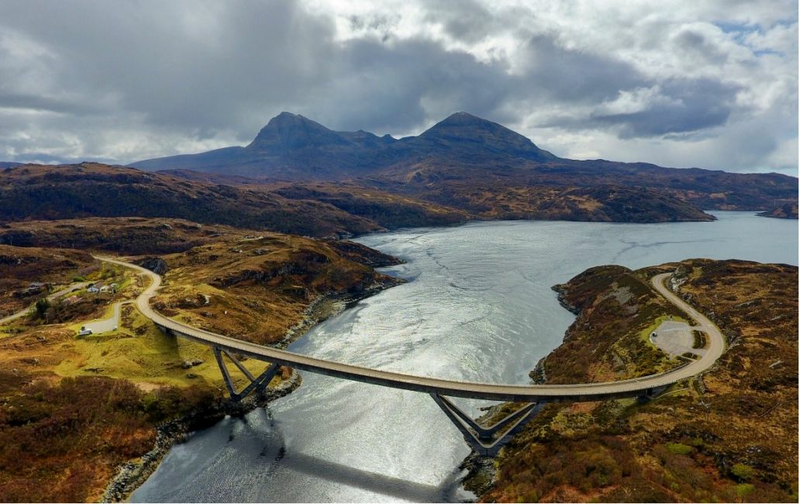 They took the A838 from Lairg, by Loch Shin, to Laxford Bridge. Then turned South for Scourie and Ullapool. If you are at JO'G and want to go back down the A838, you would have to go all the way across to Durness in the far North West first. That's quite a detour. Depending on how much time you have there are many other possible options. The further West you go, the better the scenery is! Agree... Durness to Ullapool is one the best sections of road on the planet! Well, that's quite some detour! I'd agree with the other comments that they missed some great parts of the country. Laxford Bridge to Lairg is 'ok' - but not a patch on the nth coast route. Back to Fabio - now that I've heard what the GT guys did.... another option for you, which would include some of the north coast, would be to head west from Thurso as far as Tongue, and then head south towards Aultnaharra, Lairg and Bonar Bridge. After Bonar and Ardgay, you could follow the coast road back to the A9 at Tain, or a nicer option is to head 'over the Struy' which takes you back to the A9 by Evanton. Some nice views from this road. You'd need to check that out on a map. Donald I've had a look on google maps and that is about the sort of trip i had in mind. Thank you. I know that the west coast is beautiful I went to the Caingorne mountains,lockness, Applecross, Isle of Skye and the road from Fort william to malaig in 2011. And i think that is what i'll have to do this time because my in laws are coming from Portugal to go with us and those are worth visiting. Is there anywhere else you recommend not too far from Beauly for us to visit? On the way down we will come over Glencoe. I prefer drives , but i think my wife and the children prefer walks and history. If you have any recommendations it would be great. Just thinking about this some more.. I'll send a Pm to pick up an email address. Easier to put a few suggestions together on "word" than using a forum. Won't be till later this evening though - I've an appointment with a Defender in a garage for most of today!